A 45-minute birthday magic show including Craig's amazing illusions with laughter! The birthday child will be the star of the show, performing magic in their own hands! Show also includes plenty of audience participation, comedy, and, of course, magic! "Magic Show with Balloon Sculpture"
This 1 hour program (total time that Craig will perform for your party) includes the magic show described above plus animal balloons/hats/sculptures for all party guests. Children are entertained as several different balloon creations are made, one for each child, with the birthday child receiving several special balloon sculptures! 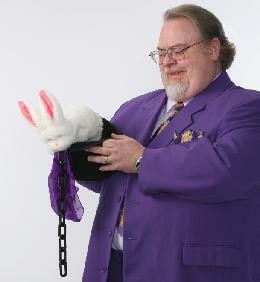 "Magic Show with Twinky the Rabbit Puppet"
This 1 hour program includes the magic show described above plus a delightful routine with a fun loving rabbit puppet. Twinky isn't the best behaved rabbit, and the kids LOVE him. The kids will laugh and cheer! Watch their eyes widen in amazement! Find the answer to the age-old question, "What does a magician keep in his hat?" You will be amazed at the answer! "Balloon Party and Learn to Twist"
This program includes lots of ballons and balloon games! Suitable for adults as well as children, each person will receive space mice and party hats, with the birthday child or adult receiving special balloon sculptures! The program finishes with "Balloon Twisting 101" where each person will learn to twist a canis latex inflatus or the common balloon dog. Kids as young as 3 & 4 and adults as old as 97 have successfully completed the "Balloon Twisting 101" class. Everyone who tries will complete a balloon dog and receive a Balloon 101 diploma! Balloons and Balloon pumps will be available for purchase after the program so the new balloon artists can continue their new craft.